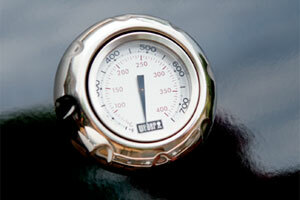 You’ll love cooking up a storm on this glamorous grilling stunner. The Genesis E series gas grill comes fully equipped with front-mounted control knobs, porcelain-enameled cast-iron cooking grates, and porcelain-enameled Flavorizer bars to effectively hold and distribute heat as you grill. Now your skills can rival those of the world’s greatest restaurants and steak houses. The innovative Flavorizer bar system, originally created by Weber, is designed perfectly to perform a variety of functions on the Spirit , Genesis, and Summit gas grills. Angled just right, the Flavorizer bars catch drippings that smoke and sizzle, adding flavor to your food. Any drippings not vaporized by the Flavorizer bars follow the slope of their unique angle and are funneled away from the burner tubes, down into the grease management system. Not only does this help prevent flare-ups inside your grill, but it also protects the burner tubes from becoming clogged. Maximize the heat without minimizing grilling space. 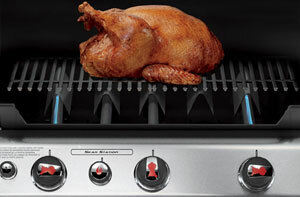 This high-powered sear burner is designed to step up the heat on demand for searing. 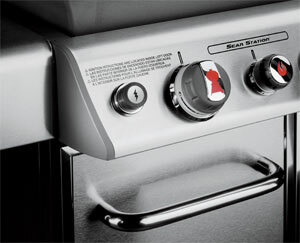 Even more, a flush-mounted side burner lets you multi-task while grilling. 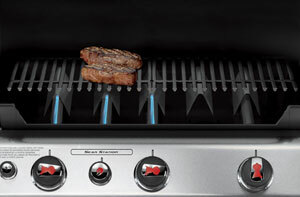 As part of the Genesis E series, the E-330 gas grill has a front-mounted control panel with three stainless-steel burners and an individual electronic ignition system. The unit offers a 38,000 BTU per hour input, and its total capacity consists of 637 square inches of cooking space (a 507-square-inch primary cooking area and a 130-square-inch warming rack). 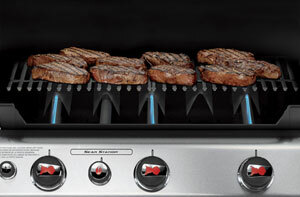 For added cooking space and delicious searing, the grill supplies a 12,000-BTU side burner and a 10,000-BTU Sear Station burner. The unit also includes porcelain-enameled cast-iron cooking grates, an enclosed cart, and a porcelain-enameled shroud with a built-in thermometer. Even more, it comes with porcelain-enameled Flavorizer bars, porcelain-enameled heat deflectors, six tool hooks, two heavy-duty front-locking casters, and two heavy-duty back swivel casters. 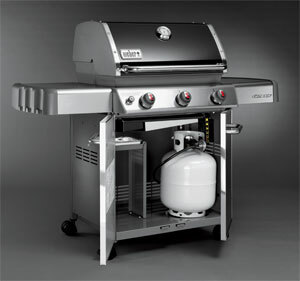 Requiring an LP tank to operate (not included), the gas grill measures 30 inches long by 60 inches wide by 64-1/2 inches high. 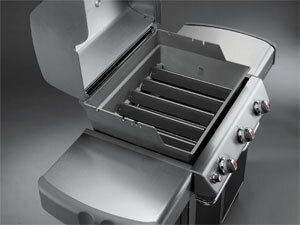 Weber covers the grill with a five-year limited warranty. Note: Images shown above are of the Weber Genesis E series in Black; features illustrated vary by model. When George Stephen created the first Weber grill, he wanted to be able to bring his family together for a good meal. He insisted on a product that would exceed customers’ expectations. 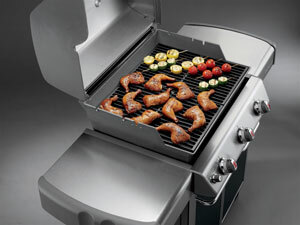 Weber grills have been and will continue to be the true definition of performance in backyard grilling. Whether you’re cooking a basic burger or an extensive meal, Weber grills are designed and engineered to give you the best performance every time.